STS-131 is continuing to move through the docked timeline, although a possibility of a fourth EVA being added to the mission – due to a problem with the Nitrogen Tank Assembly (NTA) on Station – was discussed, and dismissed late on Thursday. A MMOD (Micrometeoroid Orbital Debris) strike on Discovery’s Window 1 has also been cleared as no concern, while issues with the MPLM Leonardo are being worked on FD11. The three scheduled EVAs have been successfully carried out by STS-131 spacewalkers Rick Mastracchio and Clay Anderson, as they completed tasks associated with the changeout of Ammonia Tank Assembly (ATA). “The third EVA started at 103/06:14 GMT [07/19:12 Mission Elapsed Time (MET)] and was completed at 103/12:38 GMT (08/02:17 MET) for an EVA duration of 6 hr and 24 min,” reviewed the latest Mission Evaluation Room (MER) report (L2). 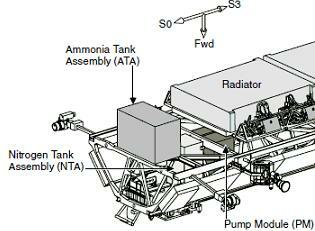 “Tasks accomplished during the EVA included hooking up the fluids lines to the Ammonia Tank Assembly (ATA), installing the old ATA on the Lightweight Mission Purpose Equipment Support Structure Carrier (LMC) in the Payload Bay (PLB), retrieving the Airlock MMOD shield and preparing the Z1 Space-to-Ground antenna. 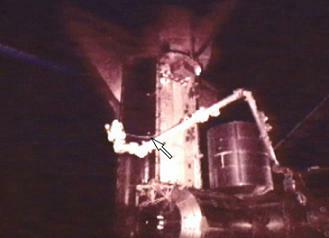 During EVA-3, controllers noted a problem with the associated NTA, via a stuck Gas Pressure Regulating Valve (GPRV). Troubleshooting is continuing, although the possibility of adding an additional docked day to STS-131 was discussed. The purpose of adding an extra docked day related to the consideration of a fourth EVA – which was to be decided at the Integrated Mission Management Team (IMMT) meeting on Thursday, but finalized late on Wednesday – which would have been conducted on Flight Day 13. A Flight Day 12 option had already been ruled out. During an extra EVA, Mastracchio and Anderson would have worked on replacing the NTA with a spare – one of two spare units – on ESP-1 and 2 (External Stowage Platform), which is attached to the S3 zenith outboard PAS (Payload Attachment System). The NTA task can’t be deferred to STS-132, due to a full schedule of EVA tasks for Atlantis’ mission, although numerous challenges would have existed with a late inclusion on STS-131. Another option – now likely to be taken – would be to add the NTA task to a Stage EVA, to be conducted by ISS crewmembers. UPDATE: Fourth EVA removed as a possibility for STS-131. UPDATE 2: Problems between the Common Berthing Module (CBM) and MPLM delayed the uninstallation of Leonardo. Troubleshooting continued for several hours, prior to a successful resolution related to the Control Panel Assembly. A review will follow in the next article. The veteran orbiter is continuing to perform admirably whilst docked to the International Space Station (ISS), as her crew completed transfers from the attached MPLM Leonardo. Final tasks will focus on transfers to and from Discovery’s middeck. Discovery’s systems are all in great shape, aiding any potential decision on adding a second additional docked day in support of MPLM troubleshooting. “All Life Support Subsystems are working nominally. Life Support console is working no issues. N2 Repress Currently in progress. Total GN2 = 254.6 lbm. Total Water = 520.4 lbm. Total Waste Water = 57.2 percent (97.7 lbm). System Status: Subsystem performance is nominal,” added MER status. Following the review of minor communication issues during EVA-1, only one item of interest was noted during video reviews of EVA-3, relating to observed debris liberating from the Payload Bay. “MER Funny (minor issue): Object observed floating from Orbiter Aft Payload Bay area during EVA 3,” a report to the Mission Management Team (MMT) noted. Video of the liberation (L2) – which appears to show what is likely to be a piece of insulation departing from aft of Discovery’s cargo bay – although this is not being classed as an item of concern. Given the location, it may have liberated from the old ATA, which had just been installed on to the Lightweight Mission Purpose Equipment Support Structure Carrier (LMC). The Payload Bay will welcome back the MPLM on Flight Day 11, ahead of docked Late Inspections – currently scheduled for Flight Day 12. “The OBSS (Orbiter Boom Sensor System) remains grappled by the SRMS (Shuttle Remote Manipulator System), and is at the MPLM viewing position. OBSS personnel completed review the Docked Late Inspection procedures, and sent review comments to (management),” added the MER. Also reviewed and cleared was the first MMOD strike of the mission, observed via photography taken of Window 1 on the flight deck. One or two visible MMOD strikes are common, especially during the latter stages of missions. “MER-11: Window 1 MMOD impact (less than 1mm, is well below threshold for concern),” added a MER report to the MMT. Preset rules for the allowable size of a MMOD impact on an orbiter window note that forward and middle windows have no issues associated with diameters of less than 1.2mm. 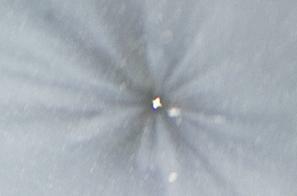 Side and overhead windows are ok if the diameter is less than 0.49mm. Managers also discussed the potential of Discovery aiding the Shuttle/Station stack in a DAM, as a debris conjunction was tracked during Wednesday night. Although there has been no confirmation a DAM was called for at time of publishing, Discovery continues to have no issues with her thrusters – should such a situation arise.